Used with permission. Copyright by Euphoria Films & Stuart McAndrew Photography. 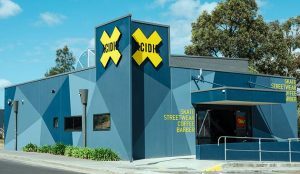 “Acidic” has become an icon to the latest Australian skate park. Supporting the skater lifestyle, it regularly hosts events and spreads good vibes to the skaters nearby with its cool music and in-house DJs. 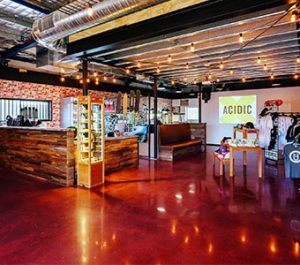 Acidic is a barber shop and skate shop combined that offers skate and streetwear, skate accessories, great coffee by exceptionally skilled baristas, and cutting-edge barber styling. The Honestone team brought to life the vision of co-owner Mr. Joey Town, in collaboration with Brent Fitzpatrick from Eight Six Design. Mr. Town wanted the design fit out to have a visual connection to the skatepark. He wanted a destination and not just a shop. He envisioned a place where people can have a good time, generate good vibes, and create new memories. Located on the NSW Central Coast, in the beachside suburb of Bateau Bay, Bato Yard is the Central Coast’s largest skate park. It features Australia’s deepest bowl for those skilled enough to dare skate in it. The skate park is characterized by its red coloured concrete. He wanted Acidic to match the red concrete of Bato Yard. Mr. Town approached the Honestone team for our skill, expertise, and international renown for producing impressive coloured concrete floors. Immediately, we knew that we were going to create something special. Our first inspection of the bare space revealed an old 200 sqm concrete floor covered in old carpet and tile adhesive from the previous tenant. However unpretty it looked, with the right skills and a wide array of flooring options, we knew we could do something special with it. Further meetings ensued with designer Mr. Brent Fitzpatrick from Eight Six Design. Together with Mr. Town, we explored all options to create the flooring colouring to compliment the overall steampunk theme. Today’s lithium-based products allow the installation to progress quite quickly due to their fast cure properties. This helps keep our labour costs down, which made it possible for us to price the job lower for a faster turnaround. Honestone was able to complete the job at a lower cost, a faster turnaround, and with a superior performance. The next step was programming the works. We advised that the best schedule to complete the works was to complete the grinding early before any building works. Then, we installed the final finish mid-project after the building works but before final fit off. The Honestone team had to remove all the surface contamination by careful operation of their diamond grinders to not expose too much of the underlying aggregate. It was imperative to achieving the goal which is to have the floor looking like the burnished finish of the nearby skate park. The tricky bit for us was we couldn’t just do a heavy grind to remove all the adhesives as this would have exposed all the concrete aggregates. That would have been the point of no return. We can’t go back from there (exposed aggregates). Really understanding your client’s vision is so important to having a happy customer at the end. That’s why we use images and photos the communicate clearly with the client. For the “Red Rock” stain to do its job effectively it was imperative that Honestone remove everything off the floor. This will allow deep surface penetration. Once the floor had been refined to a satin finish by diamond polishing, the Honestone team applied 2 coats of colour stain followed by a fast curing lithium densifier then the final sealing. The final result is a unique and striking effect: a deep red concrete floor accentuated with details of chain wire, rough sawn timber and steel tubing. The flooring showcases the Acidic offerings of skate and streetwear while sipping a barista coffee or sitting in the chair of the master barber, Mr. Joey Town. Brent Fitzpatrick Of Eight Six Design Speaks: What It’s Like To Work With Honestone? “Eight Six Design engaged Honestone to assist in providing a flooring solution to a recent Skate & Barbershop fitout. We found Rick fantastic to work with during the design phase providing various physical samples to show the client. We required unique, coloured flooring that was slip resistant and able to meet the stringent NCC and health guidelines. The product nominated by Honestone ticked all of these boxes. Honestone were also able to supply and install the specified coved skirting. Honestone specialises in polished concrete, concrete floor preparation, concrete staining, and seamless decorative flooring for various industries. We have outstripped boundaries when it comes to superior flooring and walling enhancements. But our team is more than that. We pride ourselves on our reliability, punctuality, excellence in managing costs, professional communication and addressing potential issues without a fuss. Our relationships with our clients are built on respect, trust, and competence. We respect our clients’ vision and see to it that we get the job done efficiently, with a quick turnaround. If you have coloured concrete solution needs, feel free to reach out to us. The Honestone team is in the business of helping your vision come to life via a variety of concrete flooring solutions that represent the uniqueness of your business and makes it stand out.